La Dolce Vita: Let The New Season Begin! This week marks the beginning of the new fall season for several of my favorite television shows. After a summer filled with great reality shows (Flipping Out, Project Runway, The Hills), I am feeling ready for the return of my scripted guilty pleasures. 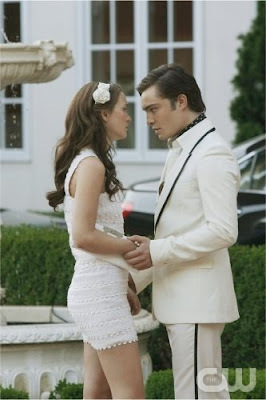 First up: Gossip Girl returns for its second season tonight at 7:00 pm on The CW. I'm looking forward to seeing what kind of trouble the kids have gotten into during their fabulous summer in The Hamptons. Tomorrow night, the new incarnation of a former guilty pleasure returns in the form of 90210, 2.0. Jennie Garth and Shannen Doherty of the original 90210 have parts in the new show. I hope it's good! Wednesday night marks the return of one of my favorite reality shows. Bravo's Top Design premieres at 9:00 pm. Margaret Russell, Kelley Wearstler, and Jonathan Adler make up the judges panel, while India Hicks joins the cast this season as the new host, and Todd Oldham reprises his role as mentor to the contestants á la Tim Gunn. The boys are back! My husband's absolute favorite show, Entourage returns to HBO on Sunday night. I am so excited for the return of Ari and Lloyd, my two favorite characters. GG is my guilty pleasure. I know nobody lives like that but it's so much fun to watch. I am so glad I am not alone in my tv addiction. :D I am so excited for the return of new shows, especially after the strike.